“An apple a day keeps the doctor away” is an English saying that likely has some truth to it. Apples are a healthy food. One study found that they might be able to lower the risk of strokes; in another study, eating an apple a day lowered bad cholesterol levels. Apples contain fiber, which improves digestion. They’re also loaded with antioxidants and vitamin C. Your body needs both of these to stay healthy. Apples belong to the Malus Their scientific name is Malus pumila. Apples are related to roses. Modern apple trees descended from wild apples found in Central Asia. The colonists brought apple trees to America from Europe. Apple trees are deciduous trees. They lose their leaves in the fall. Apple trees grow best in places with cold winters. They do not grow well in warm climates. Most growers choose apple trees that are not too large and that are resistant to disease. Growers usually grow apple trees from grafted root stock. When apple trees are grown from seed, the trees can be very large. The fruit is often sour or bitter and is best used for cider. Question: Did Johnny Appleseed really plant apples throughout the United States? Answer: John Chapman (Johnny Appleseed) was a real man who loved nature. He learned how to grow apple trees and started apple nurseries in Ohio, Pennsylvania, Ontario, Indiana, and Illinois. He left these nurseries for neighbors to tend. When the trees were big enough, they were given to nearby farmers. Visit Breezy Hill apple orchard, where over 50 different kinds of apples grow. Watch a video about nurseryman and missionary, John Appleseed. Declan, Tobin. " 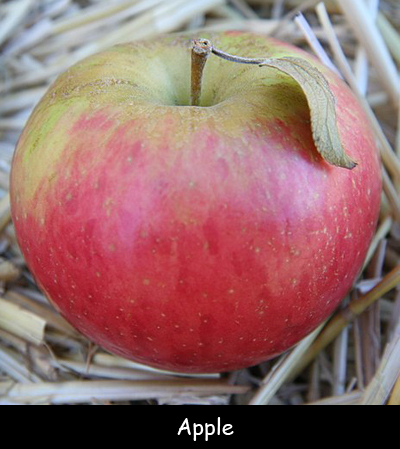 Fun Apple Facts for Kids ." Easy Science for Kids, Apr 2019. Web. 21 Apr 2019. < https://easyscienceforkids.com/apple/ >.